“Get it together. Stop flying right when I said to fly left.” Silver growled. 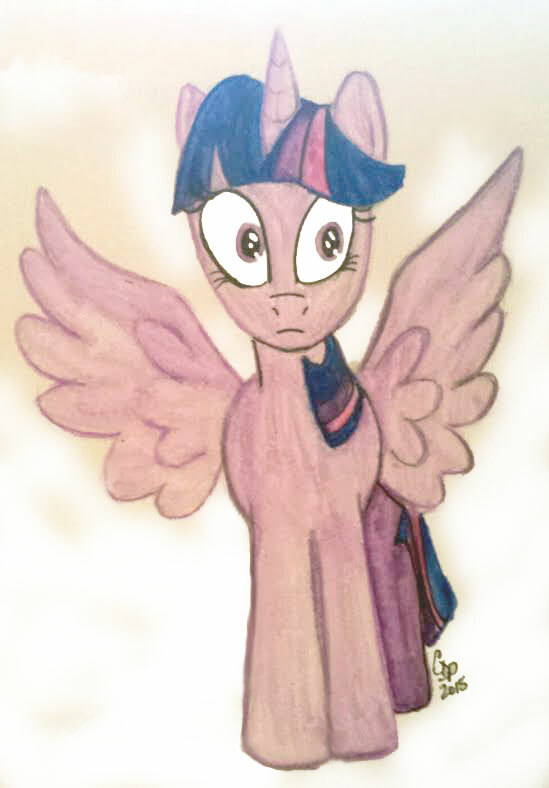 She looked at them then her ears perked up at seeing Celestia walking with a young Pegasus recruit. She looked at her recruits. “Fly laps, twenty times.” They jumped up and started to fly laps as Celestia approached Silver with the Pegasus. He had jet black mane and a gray coat. His eyes were a deep shade of blue. Silver’s recruits watched her talk to Celestia as they did laps. All three wondering who the new recruit was. “Princess Celestia, thank you.” Silver smiled. “Anything to help you.” Celestia winked as she turned. “I expect these guards to be in tip top shape next week.” She said as the recruits doing laps landed and approached. “Next week?” asked the clumsy recruit. He had a dark green mane. The new recruit didn’t say anything and just looked straight ahead. The other three looked at him curiosity burning them. “I’ll give you four a break, and I’ll be back. Get acquainted for a moment.” She flew off. The new recruit saluted. “Yes ma’am.” The other three saluted too, a bit flustered. All three looked at the newest recruit. He had relaxed and looked at them. “Um, hi.” Emerald greeted him first. The one with a white and red mane grinned. “I’m Grey Shark.” Fallacy gave him a curious glance. 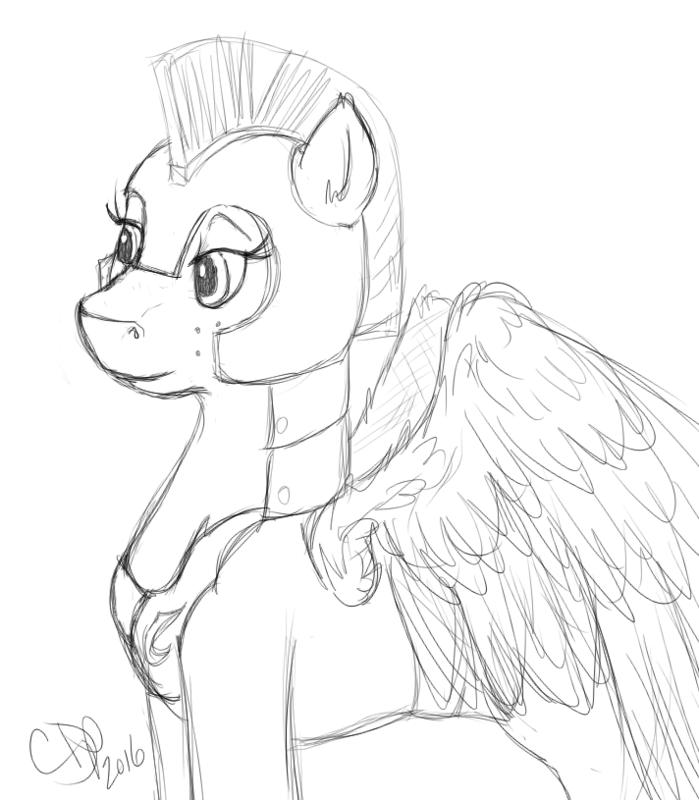 “Lieutenant Silver Dash is really a hard worker. But she gets frustrated easily when we make a mistake.” Emerald replied. “She’s freaking hot. I love looking at her flanks; bet she’s awesome in the sack.” Grey Shark replied. “He’s also an actor.” Drop Zone added. “Do you even know much about the lieutenant besides the way she looks or who her husband might be?” Fallacy asked. The three looked at him and shook their heads. “Shouldn’t we be figuring out how we can become the best guards we can?” He continued. “Yeah. I guess so.” Emerald replied. Grey Shark looked at Fallacy. “What does it matter? “You have a problem with me?” Grey Shark asked. “I have no problems with you. In a battle of wits I have the better ammunition.” Fallacy stated. “Here comes the Lieutenant.” He stood up straight and saluted. Fallacy looked at her and narrowed his eyes. 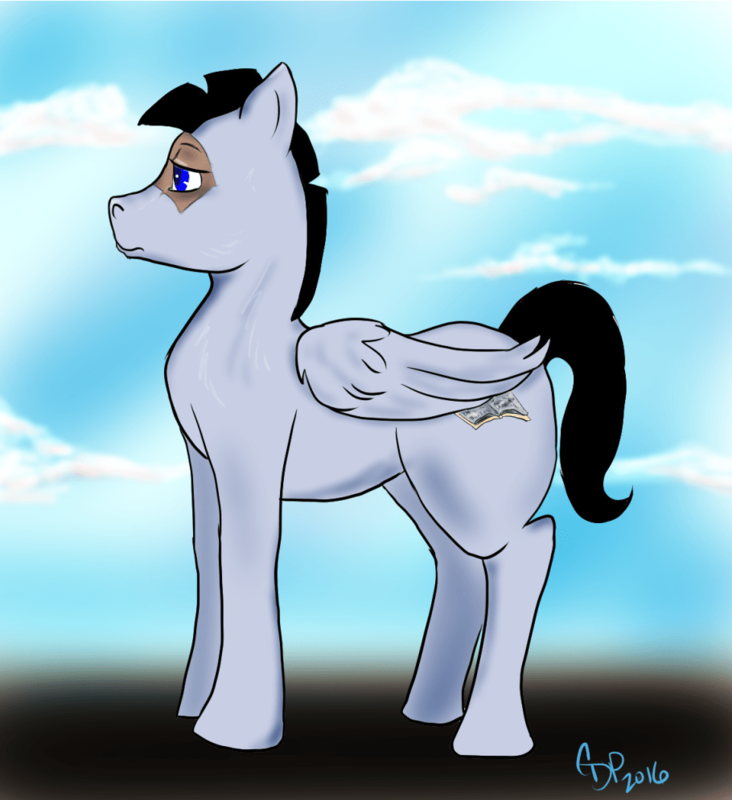 “Yes Lieutenant Silver Dash.” He stretched out his wings and took flight. The other three joined him as they started to fly along with him. Fallacy looked at him. “This isn’t a popularity contest.” He flapped his wings and started to fly faster than all of them. Grey Shark started to fly fast to catch up, but Fallacy effortlessly pumped his wings and went faster. Silver watched them fly and she smiled as Fallacy bypassed her recruits. He was the first to land having done forty laps faster than their twenty. He wasn’t even out of breath as he stood and waited for the others to land. “I think you cheat.” Grey Shark panted as he approached Fallacy. “I am just far more superior then you.” Fallacy said as he looked straight ahead. “Thank you Ma’am.” Fallacy said. The other two recruits landed panting as they stood next to Fallacy and Grey. “Sorry Ma’am. We’re trying to improve.” Drop Zone muttered. “Yes?” She asked the recruit. Fallacy didn’t reply to that he just smiled lightly. Drop Zone slowly walked forward. “Ma’am?” He saluted. “Yes Drop?” She asked him. “Who do you think, out of all of you, is ready to guard at the Gala?” Silver asked. “Fallacy is.” Emerald said quietly. “Sorry, I cannot guard at the Gala. I will be busy that night.” Fallacy stated. Fallacy suddenly grinned as he walked forward. Emerald’s eyes widened when he noticed that the new recruit’s teeth were sharp and dagger-like. “Uh…” Emerald stepped back. Fallacy chuckled softly. “I didn’t cheat at laps because I had a lot of practice at flying from one of the best teachers in Equestria.” He slowly started to stand up on his hind legs. “The next thing, I am attending the Gala with my wife so I cannot “guard” the Gala.” His front hooves started to change into paws slowly. “Oh, and if I catch you looking at my wife’s flanks again… I will tear your wings off.” Fallacy’s whole visage changed and Paradox was staring at Grey Shark with a menacing grin on his face. “You were looking at my flanks?” Silver asked incredulously. “I am sorry Ma’am. No disrespect but… your flanks, they are…” He slowly closed his mouth before he got into more trouble. All three of them shook their heads. “We’ll pay attention.” Emerald said. “I’ll give Grey another chance Doxy.” Silver said as she walked over to him. They suddenly kissed in front of the recruits. “Dad?” Lilly said nervously as she looked at the other end of the hallway she felt the hair on the back of her neck stand on end as she stared at what she didn’t quite understand. “What Lilly?” He said as he looked in the direction she was looking. “Oh… That is why there are no guards…” He reached for his daughter as long black wispy tendrils rushed down the hallway towards them. He snapped his fingers and they disappeared. They reappeared up in a tower. “What was that! ?” Lilly asked her father. “I’ll be back my double flower. Don’t worry about me.” He disappeared with a snap. Lilly looked down from the tower and saw the whole city of Canterlot. It seemed that the ponies below had no idea what was going on inside the castle. “I hope everything is ok…” She whispered to herself. A shadow suddenly appeared over her and she started to shake as she slowly turned around. The hair on her shoulders stood up like hackles… she backed away from the hideous shape that was forming from the walls of the castle itself. Slow wispy tendrils started to float around her hooves as she backed up to the balcony of the tower. “What are you?” She asked as she backed up until her rump hit the side of the balcony and she felt so much fear welling up inside of her that she couldn’t make her wings work. The wisps of smoke seemed to hiss. 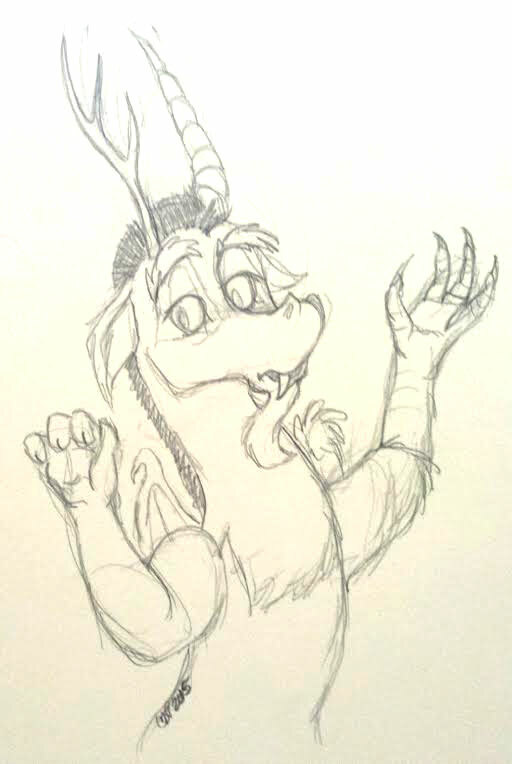 “I’ll have you know… I’m a strong draconequus. I can use my magic against you.” She swallowed hard and she finally was able to unfurl her wings as she jumped from the balcony. 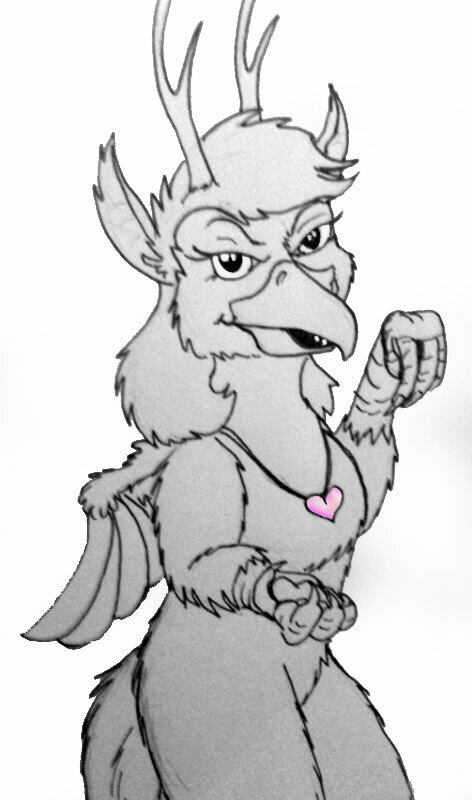 She floated down from the balcony then flapped her wings and went back to the shadow to look at it better but it was quickly receding, she touched her hoof onto the balcony though and it returned looming larger over her. She felt her heart clench up in fear as it coalesced and was forming shapes within it. Lilly stared fascinated and scared all at the same time she suddenly let out a strangled cry when she saw one of the shapes within was her father. The wisps of smoke started to flow around her as she looked at her father within; her heart was feeling despair and sadness. “Don’t let it fool ye Lilly; Daughter of Chaos. That is not your father in there.” A soft voice floated to Lilly’s ears. 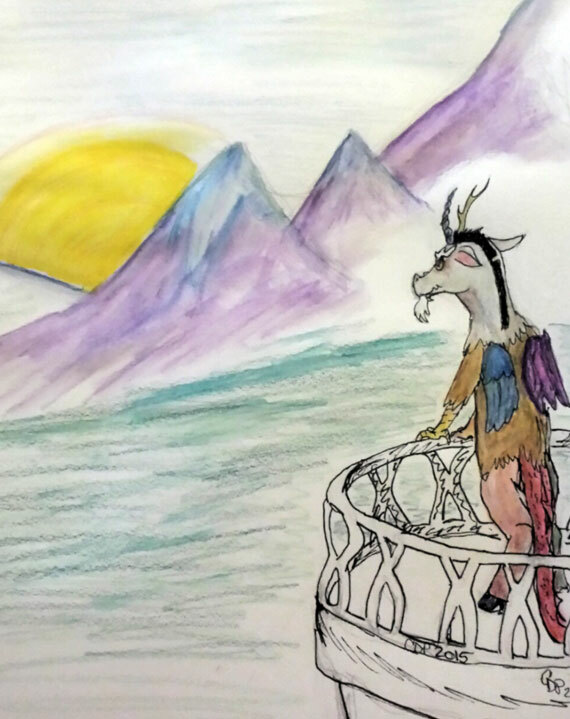 Lilly’s hoof slipped from the rail of the balcony and she fell, her wings spread out and she glided down slowly. The shadow quickly dissipated. Lilly landed lightly on one of the streets of Canterlot. The ponies on the ground looked at her in surprise and a couple backed away unsure of her since she didn’t look like them with her horn, antler, long scaly tail and bat wings. She looked around breathing heavily not knowing what she should do. “Ye need to get back to the tower.” The voice said to her. “If I go back to the tower, it will get me.” Lilly looked around for the source of the voice. “Where is my dad?” She spread her wings as she pushed off the ground and took flight again. All the ponies watched her fly upwards and they started to whisper and talk nervously. The voice didn’t answer and Lilly had a feeling that it was lying to her. She swallowed hard not knowing what to do. She was still feeling sick from being around Paradox and she felt despair sitting inside of her like a cold stone. “My double flower. Please listen to Luna.” Discord sounded strained within her head. “I’m okay, the shadow is a manifestation of your fears and doubts, try not to let it get a hold of you.” His voice was fading. “Find the hallway of stained glass, at the far end is the throne room,” Luna said. She was met with no answer. Lilly stood up and took in a deep breath. 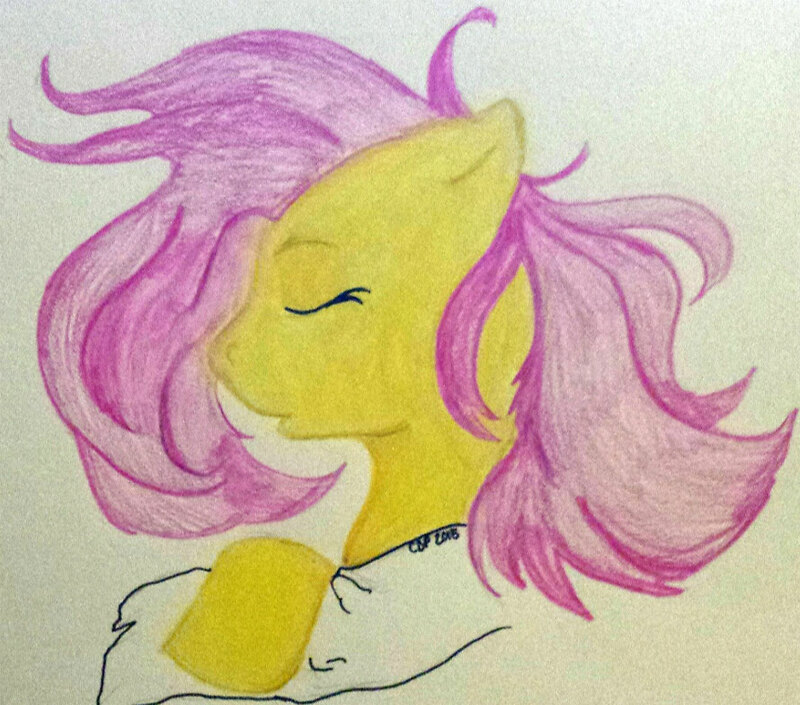 She thought of all the magic that Discord taught her as she put her head down and started the focus her thoughts. She felt her fur burn from within and she shifted her hooves slightly. She closed her eyes slowly as she thought of a protection spell and cast it upon herself. “Okay, I will find the throne room. You better not be lying to me or intending to trap me.” She opened her eyes, they glowed red with an inner fire. She spread her wings as she flew down to the hall that she thought contained the stained glass. She walked to the double doors and opened them, the hallway echoed emptily as she looked down it. It was the hallway to the entrance of the throne room. Lilly stepped into it and started to walk to the far end. The hallway started the stretch and Lilly walked faster, then she started to gallop as it stretched longer than before. Lilly flapped her wings and flew the rest of the distance until she came to the end of the hall and faced two large doors with carvings of the Sisters upon them. Lilly stood up straight and tall her coat was glowing red within and her eyes were burning like fire embers as she pushed the doors open. Celestia was slumped on the throne her once beautiful glowing mane was lackluster. She looked like a discarded marionette on the throne; her head was tilted oddly and her eyes looked empty and soulless. Lilly felt like something was slowly creeping up behind her she turned quickly and saw nothing there. Lilly approached Celestia slowly, her hooves made a hollow noise inside the empty throne room. The Princess looked like an empty shell and it made Lilly feel really frightened because her eyes had no light within as if she was… dead. “She isn’t dead.” Luna’s voice was louder in Lilly’s mind. Lilly almost jumped from her skin as she stared at Princess Celestia. “I’m here… What do I do now?” Lilly whispered as she kept looking at Celestia. Something caught the corner of her eye and she looked away from Celestia to some curtains to the side. Lilly stepped away from Celestia over to the curtains that were moving slightly. She slowly put her hoof up moving the curtain away. She saw her father… Lilly backed up from the curtain quickly as she tripped over the carpet and she fell backwards. “No… No… You said that…” The image of her father was flashing in her head, bloody, broken. “It’s playing with your mind Lilly; don’t believe what ye are seeing.” Luna stated. “I don’t… believe you.” Lilly said softly as she turned and looked up and saw that Celestia had moved. Princess Celestia had a smile on her face as she stared at Lilly with her dead looking eyes. “Who are you, are you here to talk to me?” She asked. “Are you here to talk to me?” She asked. “Princess Celestia.” Lilly said as she suddenly bowed to the Princess. “Oh, you are a proper lady, bowing to her superior.” She ratcheted her head slightly as if she was being controlled by an outside source. “I have come to help you.” Lilly said to her. “Maybe I will just take you.” The shadow slowly surrounded Lilly and she looked around her as it slowly moved to engulf her. “Lilly, we were prepared for this. Prepare for it. Your father and I; we are going to focus all our energy into your shield.” Luna said sharply. “Double Flower. Let the shadow surround you, but don’t let it see your weakness.” Discord added. Lilly felt her heart leap at hearing her father again but she held her ground as the shadow slowly started to crawl up around her hooves. She gulped suddenly when she felt her shield weaken around her and the shadow started to cover her neck and crawl up to her head. She started to panic as it got closer and closer to her face. “No!” Lilly screamed loudly. “I cannot…” She growled as she felt her shield break and the shadow engulfed her completely. Celestia suddenly collapsed to the floor as all of the shadow left her body and started to possess Lilly. The doors of the throne room opened and Luna walked in with Discord beside her. Discord ran over to Lilly and looked at his daughter, her whole body was engulfed in black but her eyes glowed red and she didn’t seem to recognize him. “Luna, you said that she wouldn’t become possessed.” He growled as he went to reach for her. 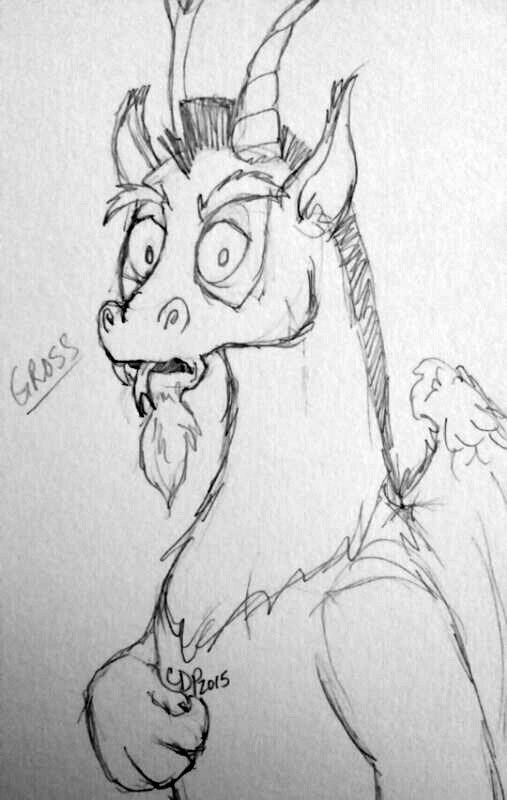 “I… don’t care.” Discord growled as he kept looking at his daughter. Lilly slowly closed her eyes and growled deeply at the whispering in her ears. It felt like creatures were crawling and scratching in her head. Her brain hurt as she imagined grabbing one of those creatures and twisting its head off. Her eyes flashed as she felt something in her soul blazing brightly through the darkness. “I think I can.” She whispered. “It is trying to get into my fears, my doubts, but I locked them away. I cannot keep it up much longer. Gah! I feel something deep inside stirring; I don’t know… what it… ARGH!” She shook as she stood there as the shadow engulfed her muzzle again. Lilly suddenly stood up and mustering all her strength she let a red ember of powerful magic burst from her. Luna’s eyes widened as she saw Lilly glow crimson making the shadow start to melt away. 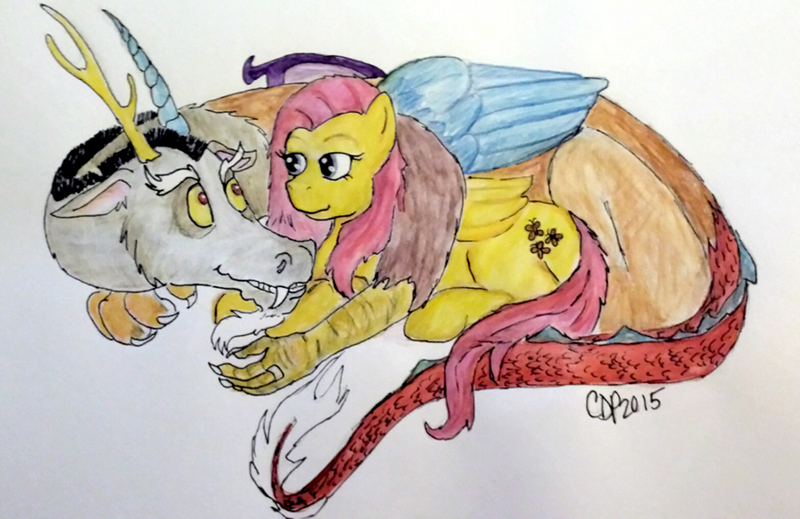 Discord watched as his daughter fought off the corruption and possession on her own; if he had known Luna was going to use her for this he would have taken Lilly home. The shadow fled from Lilly quickly as if she was burning it; slowly it went to where it felt safe before Lilly. Luna watched the shadow in horror as it started to possess her sister again. “No! Ye shall not have her back.” She lifted Celestia off the floor with her magic. She then created a shield around them both. Lilly’s whole body radiated a dark red aura and her eyes glowed crimson light as sparks of red lightning ran along her horn and antler she flapped her wings as she rose above them. “I AM LADY CHAOS! NO ONE SHALL POSSESS MY MIND AND BODY!” Her voice boomed throughout the castle and out into the streets of Canterlot. “YOU ARE TO BE CLEANSED OF THIS CORRUPTION!” Lilly pointed a hoof at the unconscious Celestia. Red lightning sparked along Lilly’s mane as well as along her wings. Luna’s protection shield faltered at seeing the raw power in Lilly. As the shield fell, Lilly used her magic to wrap around Celestia’s body until it was encased in crimson tendrils. “You wanted Lilly to help you. Let her.” He whispered as he looked at his daughter proudly. “You are to be sent away!” Lilly exclaimed as she swept her hoof slightly and Celestia was moved to the side. In a glowing magical cage was the shadow, quivering in a small ball. Lilly turned to Luna her eyes were still glowing. “Your sister is no longer possessed but she is… torn up inside. In the meantime, she needs to be taken some place safe and away from all outside influences until her body and mind are repaired.” She then turned to look at the shadow inside the crimson cage. “YOU ARE BANISHED!” The lightning moved along her body and shot out to the cage and without so much of a noise the cage vanished. Lilly suddenly collapsed on the floor of the throne room, her magic sparked as it slowly dissipated along her body. “Yes, I am.” He whispered as he pulled her to him. “Are you alright?” He put his claw up and moved her mane from her face. She was drenched in sweat and she was breathing heavily. 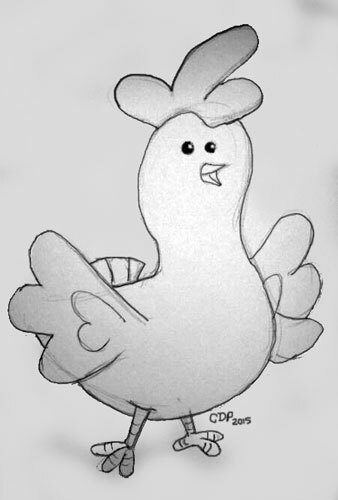 Discord shrugged. “Maybe she’s not as weak minded as you and your sister.” He said bitterly since he was angry. Luna seemed to ignore his comment. “What am I to do? I cannot run Equestria by myself, if Celestia needs to heal… I will need to tend to her as well as take care of the Kingdom.” Luna was shaking her head. He looked at Luna then looked at Lilly. “What would your mother say?” He asked Lilly. Lilly shrugged at him. “I don’t know Dad. “It is not my affair what happens during the daylight hours.” Luna stated. “Just as long as the sun rises and is taken away for my night.” She waved her hoof as she slowly lifted Celestia up with her magic. “I will return; I want to take Celestia somewhere safe.” Luna’s horn flashed and she disappeared with Celestia. “Aww, Lilly. It’s my favorite throne.” He said as he went over to it and started to rub the arms. “Don’t worry; I won’t let her hurt your feelings.” He whispered to the throne as he sat down on it.